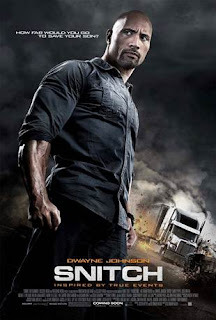 The unfairness of our nation's federal mandatory minimum sentencing guidelines for drug crimes is illustrated through motor vehicle chases and gunfights in SNITCH, a new film starring Dwayne (we're not supposed to still be calling him “The Rock”) Johnson. Sure, one could argue that this topic deserves a more high minded vehicle, but since none appears to be forthcoming I say kudos to director/co-writer Ric Roman Waugh, co-writer Justin Haythe, and the producers (including Mr. Johnson himself) for making this film. SNITCH may essentially be a mid-seventies drive-in movie with slightly bigger stars and production values, but like many of those films it has the ability to reach a different, and possibly wider audience than a more serious film by putting entertainment first and letting the social commentary take a backseat to the action. The plot used to convey the message here concerns troubled teen Jason (Raffi Gavron) who makes a dumb error in judgment by letting his best friend have a box of MDMA delivered to his house. Under mandatory minimum sentencing, he stands to do at least 10 years. Jason's dad John Matthews (Johnson) appeals to prosecuting attorney Joanne Keeghan (Susan Sarandon) using both reason and emotion, but his pleas fall on deaf ears. John's only remaining option is to ask Daniel (Jon Bernthal), an ex-con who works for his trucking company, to introduce him to one of his old drug dealing buddies that he can turn over to the feds in return for a reduction in Jason's sentence. After some early success Keeghan agrees to this deal, but as any fan of seventies drive-in movies knows the authorities can never really be trusted. For much of its running time, SNITCH is something of a slow burn. So much so, in fact, that it actually fizzles out at some point. Luckily someone noticed and relit the fuse in time for the third act climax, but it's fair to say that the movie drags in the middle. Still, I kind of admire the fact that there's precious little violence for the first two thirds of the film, with Johnson's working class dad actually coming across as a regular guy (ok, a regular guy who looks like The Rock) rather than turning into Rambo. Even when the film does ultimately devolve into a car chase/shootout near the end, it never goes completely over the top. To call it realistic would be going too far, but it's certainly more believable than the ridiculous Moscow car chase in the latest DIE HARD flick. Like Jason Statham, Johnson should be a bigger action star than he is. I don't think this is the movie to change that, but at least it's better than most of what he's been in to date. And Bernthal, who had Walking Dead fans wishing for his character's death, here shows a more sympathetic side. Sarandon may be slumming it to some degree, but she still turns in a fine performance while once again proving her liberal cred. And of course I always like seeing Michael Kenneth Williams (“Omar” on The Wire) in anything, even if he's once again typecast as a thug. Benjamin Bratt, Harold Perrineau, and Barry Pepper add further class to the proceedings. Waugh's direction and staging of the stunts once again recalls seventies drive-in movies. Nothing flashy, none of the super fast cutting popular these days, just solid meat-and-potatoes action filmmaking that allows for development of both characters and themes, and shows the action in a manner that the human eye can actually follow. There are undeniably some cheesy aspects to the screenplay, and the premise in and of itself stretches credulity. That's par for the course with B movies, though, and as such this is a pretty good one. 3 out of 4 stars.